2011 May archive at Blue Cooks. These were *really* good. I got the basic dough recipe from the King Arthur Flour website and modified it a bit to suit me. Mostly because I can’t follow directions (I’m a rebel like that when it comes to cooking). The rolls are not screaming with pumpkin flavor but they DO scream with deliciousness, with a beautiful rich color and flavor. Your house will smell amazing while they cook! 1. Mix and knead all of the dough ingredients together — by hand, mixer, or bread machine — until you’ve made a soft, fairly smooth dough. 2. Place the dough in a lightly greased bowl, cover the bowl, and allow the dough to rise for 1 1/2 hours, until it’s almost doubled in bulk. 3. Turn the dough out onto a lightly greased surface. Roll it into a 14″ x 22″ rectangle; the dough will be thin. 4. Brush the dough with milk or heavy cream. Spread the softened butter on top. 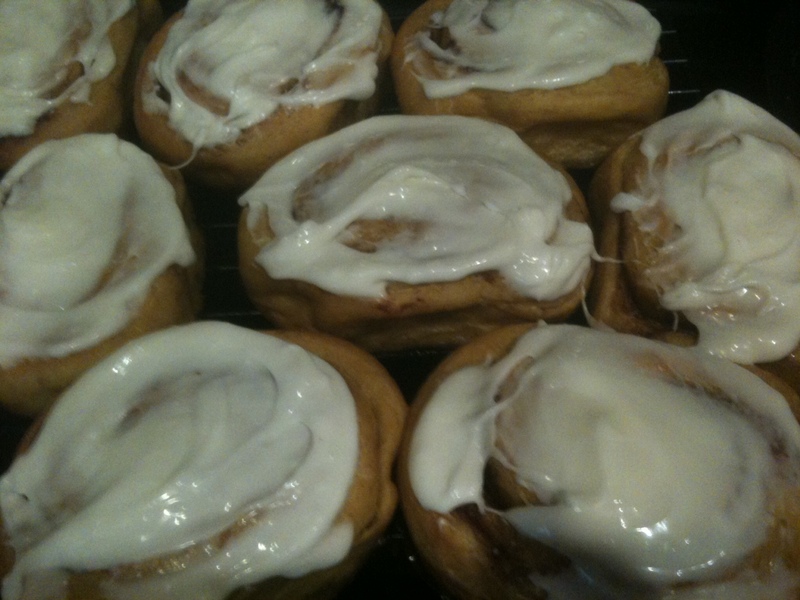 Sprinkle alot of cinnamon on the dough. I didn’t measure the cinnamon (sorry!) but I probably used at least 1 tablespoon, and as it turns out I wished I had used more. Then sprinkle 1/2 to 3/4 cup brown sugar over the cinnamon. 5. Roll the dough loosely into a long log and pinch to seal the seam. 6. Slice the log into about 1 1/2 inch thick rolls – the dough is soft and it’s best to use a serrated knife for this. This recipe made 20 cinnamon rolls for me. 7. Put the rolls into a greased pan. I greased my pans with butter (as if there’s any question on that). I used two 13×9 pans (8 rolls each) and one 9 inch cake pan (4 rolls). 8. Cover loosely with greased saran wrap and place in the fridge overnight. 9. In the morning, let the dough sit on the counter about an hour, until the rolls start puffing up a bit. 1. Add heavy cream a bit at a time and mix until the glaze is still thick, but thin enough to spread easily. 2. Spread the glaze over the cooled rolls.